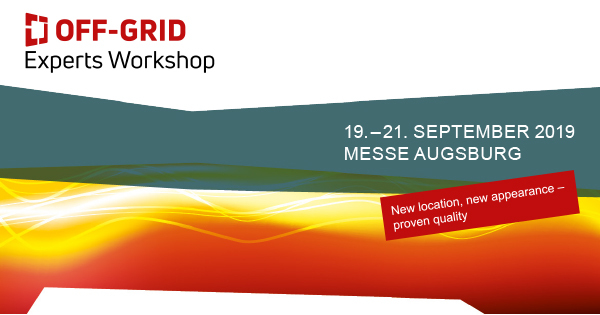 From 19 to 21 September 2019 the OFF-GRID Experts Workshop 2019 (short: OEW) takes place in Augsburg and offers you a three-day program around self-sufficient solar, wind and hydropower systems and the self-sufficient power supply. The event will take place for the first time at Messe Augsburg - with a new look and proven quality. After many years at the Memmingen location, the event will move to the Fugger city and is aimed at those interested in independent, off-grid power supply. The past organizer, the Phaesun GmbH, will support the fair Messe Augsburg with the realization of the OFF-GRID Experts Workshop further as professional partner. After the OFF-GRID Experts Workshop 2011 was launched, it has developed into the most important event of the industry. Off-grid systems are energy systems that are not connected to public power grids. They are designed as isolated solutions and work only with energy storage devices. The 3-day, compact programme with lectures by international experts, do-it-yourself work-shops, discussions and networking activities as well as many interesting exhibition stands offers you plenty of interaction, innovation and infotainment. You will have the opportunity to inform yourself about the different application possibilities of self-sufficient solar, wind and hydropower systems. Make use of the OEW and present yourself to the experts! Participation in the event is possible as conference participant as well as sponsor, exhibitor or interested visitor. Around 450 visitors from Europe, Africa, Latin America and the Middle East travelled to the last OFF-GRID Experts Workshop in 2017. The workshop will be held in German and English because of its international groups of participants and will be translated synchronously. We will be happy to advise you on your participation options.